I absolutely love the Positive Discipline 5 CD set. I feel that if I can do some of the things that are on your CDs that it will change our family's lives. I have been so passionate about this new way of parenting that I actually got my husband to listen to them. My favorite thing you say is to get excited about a mistake, so that we and our kids can learn from it. Thank you so much for making me fell empowered as a parent. Now if we can only get this thinking into the public school system. Some of you may know that the Positive Discipline Association sponsors training for people to become Certified Positive Discipline Associates. After they take the first two-day training, many decide they want to proceed with advanced training so they send a “Letter of Intent” to become a PDAIT (Positive Discipline Associate in Training). We just received the following letter from Joy Sacco. I found it so inspiring that I asked her permission to share it with others. It is my desire to be trained as a Certified Positive Discipline Associate. I was first introduced to this method in 1994 when I was hired at Carden Academy for Basic Education in Mission Viejo CA. At that time I did not have children and had not taught before although it had been my goal since the third grade. It was required that each teacher read Positive Disciple, answer the questions at the back of the book, and attend weekly meetings to discuss what we learned and how it applied to the classroom. This tool changed my life! As a child that grew up in a “loud” home, one that we called passionate. I wavered between exuberant praise and angry condemnation. It was exhausting, and not the person I wanted to be. I was so thrilled to finally be in a classroom and yet so disappointed in my inability to be the teacher I had envisioned myself to be. This book changed me. It gave me hands on, simple, word for word responses to take the place of my automatic reactions. I would read it every night and literally tape key phrases to my desk. My students soared. Now I have been teaching for 9 years full time. I have taught kindergarten through eight grade with the exception of fourth and sixth and have found that the method remains consistent and effective regardless of age. For the last four years I have been training the teachers in setting up and running class meetings and have facilitated several teachers helping teachers sessions. Class meetings are a part of our routine and are cherished by the children. A Parenting group is being formed at our school as well and will begin this weekend. Not only has it benefited my career, but it has affected my life as a mother and childcare provider. My children have been raised on Positive Discipline and it shows! One of the most important aspects that I had taken from this philosophy is that “Mistakes are opportunities to learn.” As a perfectionist it was very difficult for me to let go of focusing on a perfect result and instead ENJOY THE PROCESS, marvel and the growth, and embrace mistakes. My oldest son Noah stated it perfectly. He usually receives 80%’s or 90%’s on tests. The response is the same. We sit down and go over the test. He will show me what he did correctly and try to figure out what mistakes he made. I assist when necessary. He came home one day with a 64%. Unintentionally, I gasped. He looked at me surprised and said, “What? It only means I have more to learn.” So true! We got busy learning it! My 8 year old son Nate has become a self-reliant capable young man. He is a very picky eater! Meal times used to be a nightmare because he would pull his food apart, push it around and refuse to eat. We came up with the solution together that if he does not like what we are having he can make his own dinner providing it incorporates the necessary food groups and it does not make extra work for me. He absolutely loves it! Everyone is shocked when they see him grate, chop, use the food processor, and cook on the stove. He made eggs for everyone one weekend before we were even up! What used to be a headache has now given him a valuable tool. He does want to be a chef one day, (as well as a football player!) The four years that I was able to stay home with my boys and really grow proved to be invaluable..
During that time I supplemented our income by watching children at our home. One woman had an 18 month old son. Her job included teaching and overseeing the public schools newly implemented pre-school classes. After a couple of weeks she said, “What have you done to my son?” I introduced her to Positive Discipline and she absolutely fell in love with it! Together we attended the Positive Discipline in the Classroom workshop in Kingston, NY, with Barbara Kinney on August 23-24, 2002. It was later mandated for the elementary public school teachers in the area to learn and implement this method. She continued her training and began teaching classes at the local college. I always went to provide support. 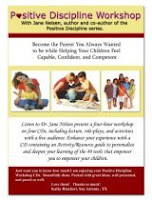 I have since attended the Teaching Parenting the Positive Discipline Way in San Diego, CA with Jane Nelsen on September 7-8, 2007. With this new tool I found the confidence to teach parenting classes at Toby’s house, a home for expectant young mothers with no family or home to which they can turn. I have been so blessed through this experience! Being a part of a group of enthusiasts which meet once a month at Jane’s house in Carlsbad has instilled me to actively seek to spread the word and reach the community with this much needed tool to empower children and adults alike. I am hoping that acquiring my Positive Discipline Associates Certification will give me this opportunity. It is always fun to interview someone who is so enthusiastic about their successes with Positive Discipline. Following is the email I received from Stephanie Peterson-Ferrel before calling her for an interview. Be sure to check out her website. Her writing is humorous and captures the feelings of many people. I'm not sure where to even start with my success story. I guess a little background would be helpful. Feel free to use only what you think is appropriate. When I had my oldest, I was a young mom, and my own parents were pretty "traditional" in their methods of discipline - if I made a mistake, I was spanked or grounded. If I did well, I got lots of "attagirls". Naturally, I felt like this would work out for me with my own children. After all, I turned out "fine", didn't I? When my son was about three, there was a night when I overreacted to something he'd done. I won't go into the shameful details, but I made a decision that night that I wouldn't hit my kid again. Seeing that small child afraid of me was enough for me to stop and say, "Whoa. What am I doing??" And that was the end of spanking as a method of discipline in our house...well, most of the time. It was very hard for me to give up spanking as a method of discipline as it seemed so effective, and I really had no "replacement" for it, other than yelling and nagging. Over the past decade since my decision to stop hitting, I'm ashamed to say I've struck my children in anger and frustration. Not often, but often enough that I'm squirming now just thinking about it. I can very clearly recall the last time I struck either of my kids (it happened to be my then 5 year old daughter), and the thought that went through my mind was, "There has got to be a better way. This isn't helping anyone." I promptly apologized to my daughter, and she forgave me. Kids are better than adults at forgiveness, I think. After that last time I hit my child, I started voraciously reading parenting websites and magazines. I frequented parenting message boards. I asked for advice from mothers I knew. I was desperately searching for a method that could work for me and my children. I was seeing signs that my son was alternating between being a praise junkie and being completely rebellious. My seven year old daughter was trying her hardest to be the "perfect" child, and she was terribly hard on herself when she fell short of her standards, even though we weren't terribly hard on her. I just knew I had to find something and fast. Unfortunately, my piecemeal approach to parenting wasn't giving me the results I wanted. Another thing that's changed is how often our children fight with each other. Without the "payoff" of Mom or Dad getting involved, they seem to be able to resolve their arguments with a minimum of fuss. The first few times they heard, "I have faith that you can work this out yourselves," they both rolled their eyes and huffed off. Since then, though, they've realized I'm serious, and they work it out themselves. Joy! I think the absolute hardest part really has been to stay out of things. So many times, I find myself wanting to "fix" things for them, and since reading PD, I've realized I'm not fixing anything. I'm robbing them of their ability to learn from their mistakes and to become capable of making their own decisions. I've spent a lot of time in Positive Time-Out learning to keep my big yap shut, but again -- it's been worth every bit of effort. My son who was previously incapable (or so I thought) of doing his homework without reminders (read: nagging) now does his homework on his own. My daughter has learned that making a mistake is just not a big deal, and I've seen her ease up on the need to be the "perfect" child. Once in a while, a rare human being takes the risks necessary to do something about the injustices in the world. Paula Flowe is one of those rare people. I feel honored that Paula is becoming a Certified Positive Discipline Associate. Read the following to see what else she is doing. Be sure to check out Paula's website.